The “Boost Up” 15W Wireless Charging Pad from Belkin is the highest wattage, fasting charging we’ve found for Samsung smart phones and tablets. It’s relatively cheap, retailing for $50 to $60. This charging pad also supports Apple devices (iPhone X, iPhone 8 Plus, iPhone 8) in addition to the Samsung products (Galaxy S9/S9 Plus, S8/S8+, S7/S7 edge, Galaxy S6/S6 edge) and other Qi Enabled electronics. For now, only the Samsung Galaxy S9 / S9+ can take advantage of the 15W maximum power transfer; The other devices max out at 5W or 7.5W. We like Belkin Boost Up 15W Wireless Charging Pad (about $57) for it’s matte finish surface – your phone won’t slide off. The slide off issue was a problem with some of the other pads, especially when an incoming call gets the phone vibrating on the pad. With the Belkin Boost Up, you can be sure that once you put the phone on the pad, it won’t move around on its own. This is important, since there is an optimal alignment for the coil in the phone and the one in the pad to get the maximum power transfer (and fastest charging time) to the phone. You don’t want to put the phone on the pad for an overnight charge up, only to find in the morning that the battery is dead because the phone vibrated itself off the pad. Which brings us to the next thoughtful feature – the Belkin Boost Up pad has an embossed ring on the pad to clearly, but tastefully, show you the charging area to place your device. Place your phone on the pad, and watch for the green LED indicator to light up; You know your phone is now charging. Like most quality wireless charging devices, the Boost Up charging pad also has foreign object detection (FOD) built-in. This means that if someone mistakenly puts their keys or wallet on the pad, the electrical power transfer won’t start. FOD minimizes the risk of the pad overheating, wasting power and other unwanted issues. Unlike other charging pads, the Belkin works with your phone in most types of cases. Even with a relatively thick case (up to 3mm), you can still wirelessly charge up. So no need to take the phone out of the case! Another feature we like about the Belkin is that it comes with a power supply and a DC connector, which is needed for a 15W charger – the wall-wart produces a maximum 2 amps at 12 volts. Many of the wireless / QI chargers use a USB cable for power, which maxes out at a nominal 5V. 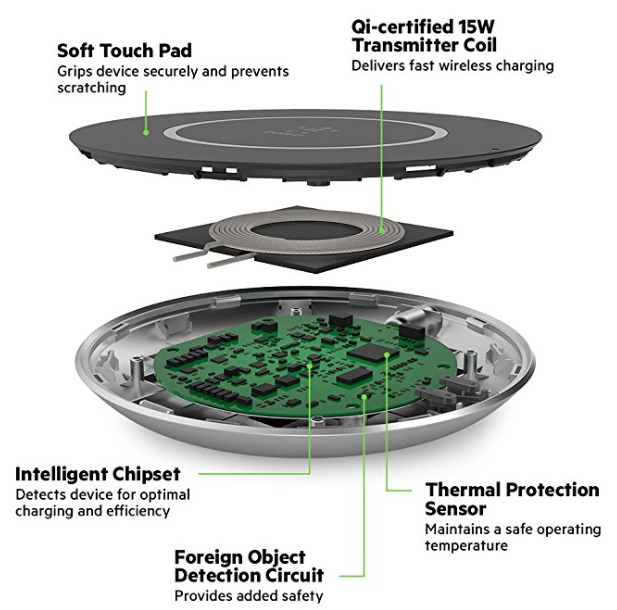 The Belkin Boost Up Wireless Charger supports both wireless charging standards: “Qi” and “PMA”. So you can be assured that whatever devices you have, you can charge them up. At 1.1 x 3.6 x 9.1 inches and 4.6 ounces , it’s a lightweight and compact sized pad. One final benefit to choosing the Belkin – it comes with their Connected Equipment Warranty: If your device is damaged by an electrical charge while properly connected to the charger, Belkin will repair or replace it up to a value of $2,500. What more do you need? Get it today!